Sizing | Bostin' Ride Online booking for our 2019 events are now OPEN! Enter online now! All of our Bostin' Ride cycling jerseys are manufactured to a Club Cut style which means that they are slightly less tight than a Racing Cut, and better suited to the requirements of social riders. 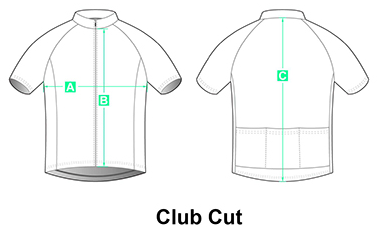 Their sizing however can be deceptive and, unless you want the jersey to be very snug, we would always recommend buying a size larger than you would normally buy or the measurements suggest. The size charts below are measurements of the item of clothing and NOT the measurements of the person who will wear it! If you are not sure about your size then find a piece of similar clothing that you wear, lay it on a flat surface and measure it across the appropriate places. Compare these measurements to the sizing tables below.